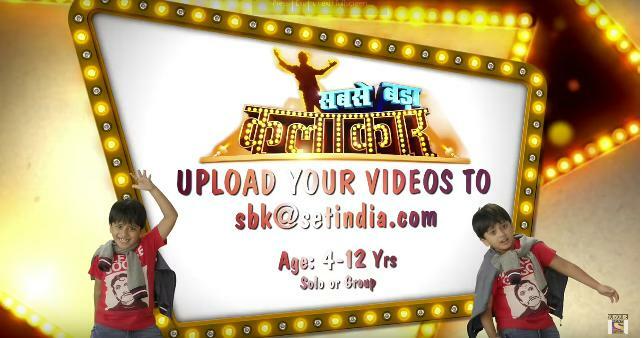 Sabse Bada Kalakaar is a talent hunt reality show which will air on Sony Entertainment Television Channel. This show is designed to hunt the super kids who has unique qualities to entertain. Ater the dance reality show super dancer of kids this is very first time sony TV coming up with such Show to hunt the Entertaining and Acting qualities of Kids Contestants. The kid of age between 4 to 12 years can be part of this talent hunt show. Hurry up!! If you think that your child is full filmy and he is good at making excuses in filmy style. If you think that your Kids having an Amazing Entertaining qualities and have unique talent. Then it’s time for you to upload a video of your child either Solo or Group showing an act and upload to YouTube or any Other Site. You can record and send their videos to the official Sony TV and your super child can be Part of this talent hunt show. After uploading videos of your little one send the video link to Sony TV official email Id given below and he/she can be part of the audition. Raveena Tandan one of the most beautiful and acclaimed actresses of all time is all set to Judge reality show Sabse Bada Kalakar. The other judge is a famous bollywood choreographer to a popular actor, none other than ‘circuit’ aka Arshad Warsi who is going to be giving Raveena Tandan company on the judging panel in Sony TV’s reality show Sabse Bada Kalakar. The judges of Sabse Bada Kalakar will be not be judging only their individualistic skills like dancing or acting but their overall ability as an entertainer. The kids between 4 to 12 year old are eligible to be part of this talent hunt show. They can perform either Solo or in Group. The show will be air on Sony TV (Sony Entertainment Channel) on every Saturday-Sunday. Starting Date and Time is not declared yet. So keep connected to us for further update. Sony Entertainment Television Channel’s Sabse Bada Kalakaar is another reality show for kids like it’s dance reality show ‘Super Dancer’. This show is going to be big hit too as Super Dancer. Here judges are going to judge kids overall ability as an entertainer not a single talent like dancing or singing as it happens usually in dancing or singing reality show. The two judges of this show makes it complete entertainment package one is Arshad Warsi, the best best Kalakaar of Bollywood. No one can forget his kalakaari (Acting) as role of Circuit in Munna Bhai MBBS with Sanjay Dutt and the other one is 90’s diva and acclaimed actresses of all time Raveena Tandan. The promo of Sabse Bada Kalakaar is showing that a kid is making excuses to Doctor in filmy style. So be tune with us for latest update and reviews on Sabse Bada Kalakar. I want to know some query about sabse bada kalakaar what should be the length of video and the audition time of up and Delhi.the last date of uploading video. Till there is no confirmation on video length. For more updates on Sabse Bada Kalakaar, stay tuned.